Sericea is an erect, perennial shrub up to 5 feet tall. Stems are hairy only along the ridges on the stem. Leaves have three leaflets, each less than 1 inch long and less than ¼ inch wide, wedge-shaped (cuneate). Plants flower from mid or late July to October. Flowers have yellowish petals sometimes tinged with purple and are about ¼ inch long. Seeds are borne in pods about ⅛ inch long, broad, and flattened. Type and Class of Livestock: All classes of sheep and goats; Sericea can be toxic to cattle. Grazing Objective: Reduce plant biomass and prevent flowering and seed production. Growth Stage for Treatment: It is important to graze young plants early in the season. Sericea becomes much less palatable after bloom as levels of lignin and tannins increase with maturity. Two or more treatments are necessary each season and three to several years are needed to weaken plants. Potential Effectiveness: Grazed plants are often smaller next year, but plant density has not been shown to decrease with grazing. Early intensive grazing followed by chemical control seems to provide the most effective control of Sericea. Vermeire, L.T., T.G. Bidwell, and J. Stritzke. 1998. 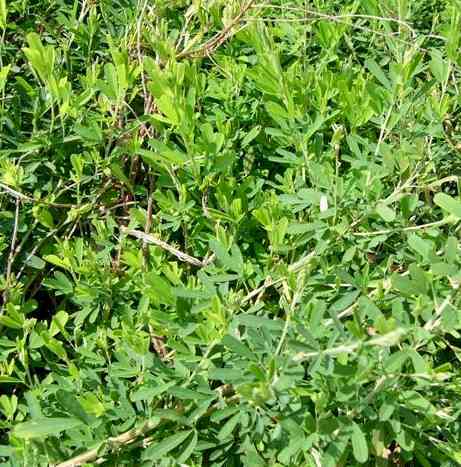 Ecology and Management of Sericea lespedeza. Oklahoma State University Cooperative Extension Bulletin F-2874. Available at: http://www.okrangelandswest.okstate.edu/pdfFiles/OSUextPubs/F-2874.pdf. Accessed 12 July 2006.